Getting to the Gili Islands is a short, stunning boat ride away from Bali. The hum of the motor drowns out the world and the scene is set for getting lost in daydreams and finding shapes in the clouds. Pulling up to the Gili Islands, the energy is already much calmer than Bali. Only a few boats line the harbor made up of a single, short pier. Kids laugh and play and climb the colorfully painted parked boats. Everyone else lazily reclines under shade. Disembarking is met with welcoming, friendly smiles from the locals, unsurprised to see you, like they’ve been expecting you all this time. Transportation on the island is made up of bicycles for hire and horse-drawn carriages. The horses are adorned with brightly colored tassels and shells. Lining the perimeter of the island, sand covered paths lead through rows of restaurants, cafes and shops made of bamboo and dried palms. Bean bags and airy huts are the preferred seating option for sipping coconut, banana, papaya smoothies or cocktails. Empty, tree-lined lanes lead to exploration of local life. Finding a quiet beach all to yourself is easily done. Walking the whole island takes under an hour. 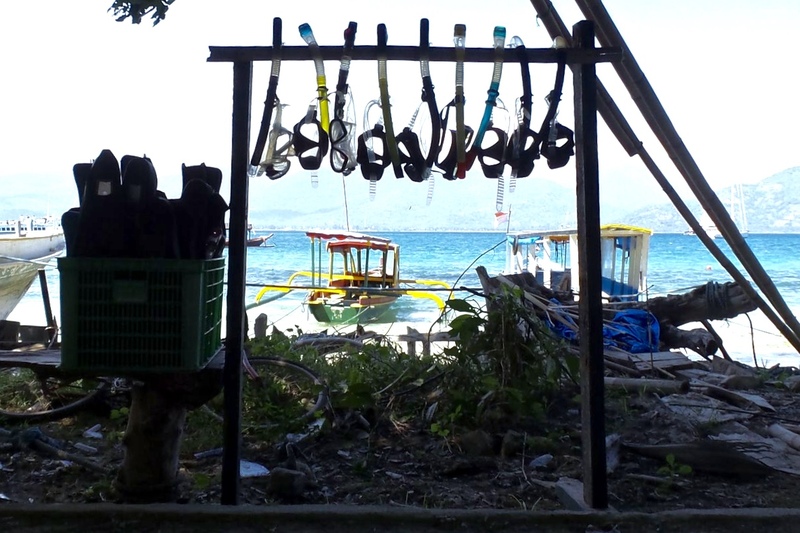 For now, Gili Air still holds that magical feeling of a paradise unspoiled. A small, basic, bamboo bungalow to rest your head is best. Nothing more than a bed, fan, hammock, and unobstructed view of crystal clear waters with boats in the distance against a backdrop of foggy, tree-dense mountains…perfection. Living like this gives you space to think. It’s amazing how busy one can stay in paradise. Early morning runs, snorkeling and diving, nooks to explore, locals to befriend and tropical treats to indulge in quickly fill the hours of the day. And before you know it days turn to weeks. It’s like never-never land, and I never want to leave.